← New Phone, Apps Recovered! If you’ve seen Bambi (who hasn’t? ), you know that “twitterpated” is the word Friend Owl uses to tell the young animals that spring is coming and they will fall in love. The three friends, Bambi, Thumper, and Flower, promise never to lose their friendship sanity just because of the shininess of the first pretty girl they see of their species. I’ve been twitterpated by the shininess Twitter (@DianaBeebeTX, if you want to follow). Can you believe it? My use of the social media shiny is limited to a few friends, my alma mater (gotta keep up with the Frogs! ), and my widening circle of writing friends. I don’t follow any shows or celebrities, except Dr. Horrible because…well, just because. I live in a fairly small, sheltered bubble. I also try to think before I post. I hope I have not forsaken my sanity for the shiny that Twitter holds. Free technology. No free lunch! When I went to open house at my daughter’s high school, one of her teachers encouraged the students to follow his class (not him personally) on Twitter. They could ask him questions about homework and projects. So why was I surprised to hear that a student (already in trouble for drinking on campus) tweeted that she was going to attack another girl at school? And she did attack her in a hallway. A few days later, some students thought it would be “fun” to act up in the halls. Rumor in the school is that it was a flash mob attempt, started on Twitter. The school now has strict class change procedures with teachers lining the halls, one way stairwells, and extra security in the building. Because a few young teenagers misused Twitter and acted on the misuse. 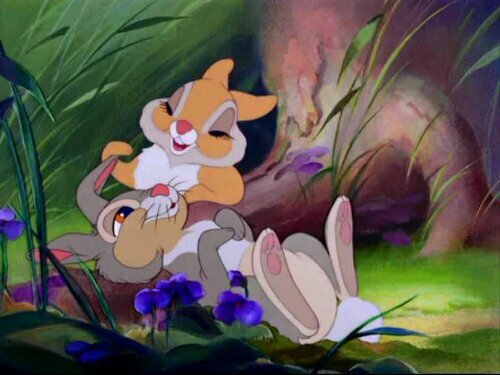 Did they get twitterpated by the shiny of tweeting–can’t see beyond their little circle of tweeps like Thumper who wondered off with the first cute girl rabbit who batted her eyelashes at him? Did they think that no one else would see that one tweet because of an @ mention to a specific person? Not a lot of thought goes into that kind of twittiness. This was not an Arab Spring. There was no higher purpose. There were kids misbehaving and making the school miserable for the rest of the students. According to the school, two students were arrested (no details were given, of course). Public tweets and videoed assaults are hard evidence though. Students were told more trouble would follow if anything else was posted. You would think that as tech savvy as teens are these days that they would also understand that what they post is out there. They can’t take it back on Twitter. Their thoughts, motivations, and pictures are there for all the world to see. Their teachers and potential employers can see it, too. New users on Twitter are not that different than a teenager in lurve for the first time. Now give Twitter to a teen who doesn’t realize that more people than the tweeps who follow them can see what they post, or maybe they don’t care. As someone fairly new to Twitter, I still wonder if something I post makes me sound like a twit. I’m not so new to being twitterpated that I hit send everytime I think of something to post. Twitty and witty are two different things. Until Mission Impossible technology catches on, what gets tweeted is out there for the world to read. There are companies out there that are creating “This message will self-destruct” applications. You pick the time table–5 seconds or 6 days. An article on NPR about a startup called Wickr that is doing this for iThings. The technology isn’t there for everyone to use yet. So until our emails, tweets, and Facebook posts can self-destruct, we need to teach our kids how to behave. If you know teenagers who are twitterpated with Twitter, please make sure they are using it wisely. Heck, make sure that you’re using it wisely, too. That’s not always easy when adults in high government positions get caught in scandals because of things they’ve posted. They were twits twitterpated by their own perceived cyberspace bubbles. You know who they are. If you’re a parent of teens, do you even know if your child is on Twitter? If so, are you following him or her? Are you monitoring phone and web activity?